Price: $8 $13.79 41.99% off i The regular prices might have a slight change due to amazon seller's control. 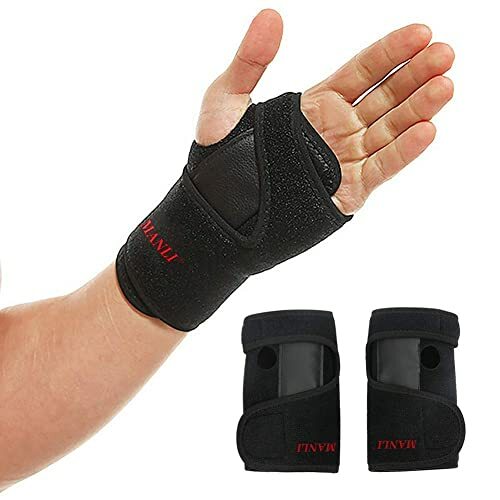 【HELPS RELIEVE THUMB & WRIST PAIN】- Wrist Support helps relieve discomfort from swelling, muscle strain, sprains, arthritis, and general wrist pain. It provides compression and support for either the left or right wrist and is adjustable so you can achieve a custom fit. 【ADJUSTABLE FOR PERFECTLY FIT】- It comes with a removable splint which allows you to adjust the level of support as needed. Plus not like other brands tend to lower grade velcro which can slip or loosen and require regular readjustment, we uses the highest quality velcro to ensure consistent wrist compression. 【PROVIDES ALL DAY SUPPORT】- Our wrist Support is made of a soft, breathable neoprene fabric that is not only lightweight but offers excellent moisture wicking properties. This allows you to wear the product overnight without excessive sweating or wrinkling. 【EASY TO USE】- Wrist Support a cinch to put on and use. It fits snugly over your hand to support the wrist area so you can engage in your usual activities with ease. Hey,come to try Wrist Brace Support, 1 Pair Left Right Hand Wrist Support/Wrist Strap/Wrist Brace/Hand Support for Carpal Tunnel, Relieve,Treat Wrist Pain, Men, Women (1 Pair) now.It's a trial rebates.